In Part 1 of this series, we were introduced to the INS records in ProQuest History Vault on suppression of radicals during and after World War I, and we read excerpts from interviews with Schulim Melamed and Jankel Moskovitz. In addition to the individual interviews like the ones with Melamed and Moskovitz, the majority of the Immigration collection on suppression of radicals focuses on two case files from 1917-1918, dealing almost exclusively with immigrants suspected variously of being anarchists, belonging to the Industrial Workers of the World (IWW), subscribing to the Cronaca Sovversiva, or belonging to the Union of Russian Workers. Most of the subjects in these cases were male, and many were young (20–30 years old). Not surprisingly, given their humble immigrant backgrounds, most of these men worked as agricultural laborers or in the coal, steel, and timber industries. In the first case file (54235), most of the immigrants targeted for deportation were accused of anarchism, specifically with violating the “anarchistic section of the immigration law,” which forbade the entry of people who advocated anarchism or the overthrow of the U.S. government by force. 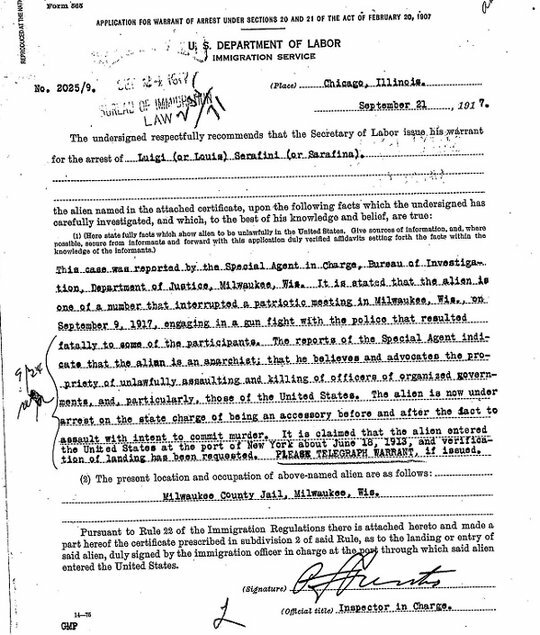 Documents in a typical case file consist of testimony, from both the accused and other witnesses; radical, anarchist, and IWW pamphlets, songbooks, and membership books; official reviews and recommendations on the case, often by Louis F. Post or Anthony Caminetti; bond records to secure the subject’s release; documents noting the immigrant’s initial entry into the United States; and occasionally letters of support from acquaintances. 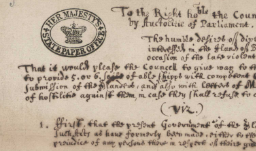 The testimony records are particularly rich, offering biographical details as well as information on idiosyncratic attitudes toward government, anarchism, and society. In a number of cases, the subjects were found to be nonthreatening, either because they were not anarchists at all or because they subscribed to a nonviolent form. Not all suspected anarchists were innocent, however: a cluster of cases in case file 54235 come from Milwaukee, where a large pipe bomb killed ten policemen and detectives on November 24, 1917. Other Milwaukee cases stemmed from a September 1917 riot in which Italian anarchists interrupted a “patriotic meeting” held by the Italian Protestant minister August Giuliani. A few later cases resulted from the bomb incident, but most of these suspects were arrested simply because they were Italian or because they had attended one of Giuliani’s meetings. A significant number of cases in the collection grew out of a November 1917 raid on a meeting hall in Seattle that was jointly used by the Union of Russian Workers and the Circolo di Studi Sociali (Club of Social Studies), an Italian reading group that tended toward anarchism and whose mouthpiece was the radical periodical Cronaca Sovversiva. Both the Union of Russian Workers and the Cronaca were viewed by the government as hopelessly tainted by violent strains of anarchism. The Union of Russian Workers, like the IWW, tended toward open confrontation and violent resistance in the fight against capitalism. Virtually every deportation hearing from the Seattle raid contains copies of the same anarchist literature seized during the raid: the Italian cases have the Cronaca and other anarchist publications, while Russian cases contain IWW literature. 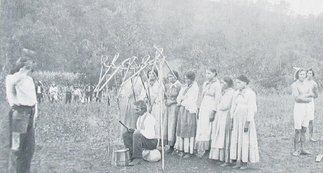 Some suspected Italian anarchists lived in Cle Elum, Washington, where there was a local Circolo di Studi Sociali; others lived in Roslyn, Black Diamond, or elsewhere. The Seattle immigrants were not alone: another group of Italian immigrants from Portland, Oregon, were also targeted by immigration authorities. Like the Seattle Italians, their main crime was belonging to the IWW or subscribing to the Cronaca Sovversiva. In Akron, Ohio, a group of Russian immigrants were also charged with belonging to the Union of Russian Workers; they were arrested while holding a meeting at the IWW headquarters. In Part 3 of this series, we will look in more detail at cases pertaining to the Cronaca Sovversiva, or Subversive Chronicle, and other cases files pertaining to the Bureau of Immigration’s investigation of radicals from 1917-1918. Librarians: learn more and sign up for free trials of ProQuest History Vault modules. Plus, learn about complementary resources including ProQuest Executive Branch Documents, the new ProQuest Executive Orders and Presidential Proclamations 1789-2014 releasing soon, ProQuest Digital U.S. Bills and Resolutions, 1789-Present, and ProQuest Historical Newspapers™.